Every day, like millions of Americans, Dr. Walter Koroshetz, 65, who directs the National Institute of Neurological Disorders and Stroke, takes a pill to control his blood pressure. He claims besides the therapeutic benefit of lowering his blood pressure, his medication helps him reduce his risk of dementia and helps keep his brain healthy and sharp. Koroshetz is responsible for the institute's public health campaign called Mind Your Risks. Its goal is to let people know that there is a link between high blood pressure and stroke and dementia. Koroshetz, as part of his campaign, also endorses efforts to keep your blood pressure down by exercising and paying attention to weight and diet. The science underlying his concerns over high blood pressure is solid. Researchers have long understood that when blood pressure rises, it strains the tiny blood vessels that keep brain cells alive. "If you had a stroke, even a small stroke, your risk of dementia within the next two years was greatly magnified… So there's something about having a stroke that drives a lot of the processes that give rise to dementia." The evidence is clearest for a type of dementia called vascular dementia, which occurs when something blocks or reduces the flow of blood to brain cells. Now, as a result of new studies, it seems that high blood pressure also appears to increase a person's risk of developing Alzheimer's disease, which is associated with the accumulation of plaques and tangles in the brain. "Only about 50 percent of people who have hypertension are actually treated," he says. "So I think there's a lot to be said for trying to get high blood pressure under control." The Alzheimer's Association is helping get out the word through Koroshetz's campaign and via a presentation of new research on blood pressure and Alzheimer's at its annual scientific meeting in Chicago. And the group is encouraging people to control high blood pressure. "The good news is that we can control blood pressure now," says Maria Carrillo, the group's chief science officer. "We can do that with exercise, with lifestyle, with healthy eating, and also with medications." I just wanted to say what a great product you have in Revatrol. I’ve been taking Revatrol for 6 months and I just love it. Although I am not a doctor, I feel like it strengthens my immune system and protects me from getting the flu. 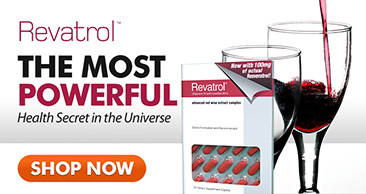 With flu epidemics on the rise, I would recommend Revatrol to everyone who wants to give their immune system a much-needed boost!